Two-seat monoplane dive bomber, with a quasi-elliptical wing. 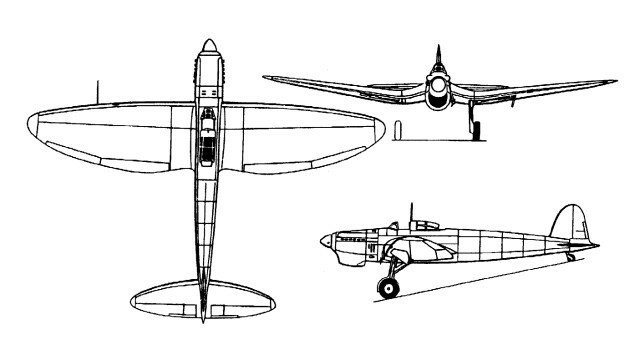 The He 118 was larger and more refined than its competitors, with an internal bomb bay and retractable landing gear. First flown in the summer of 1937, the He 118 could not safely exceed a diving angle of about 50 degrees, while the Ju 87 could be dived vertically. Total production was 15 examples including 2 of the 4 prototypes, (V4 and V5), provided to Japan. By early 1938 the Japanese Navy had also acquired the German He 118 V4 two-seat dive bomber aircraft, along with its production rights. This aircraft was powered by the DB 601A. The Heinkel's spectacular performance impressed the IJN Naval Staff so much that the design of the Yokosuka D4Y Suisei (Allied reporting name "Judy") carrier based dive bomber evolved from it. Ten examples of the production He 118A-0 were built. 250 kg of bombs were carried internally or 500 kgs of bombs internal when flown solo. The He 118 is best known for its role in the testing of jet engines.